The technicians working at Carr Subaru are professionally trained & certified on how to work on your specific Subaru model. 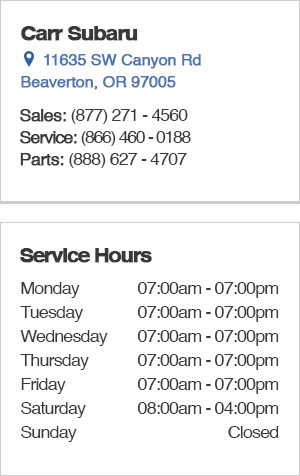 As part of our high-quality, low-cost dedication to our customers, we regularly update our Service Specials and Auto Parts Specials. Whether you're in need of a brake inspection or need your essential engine fluids flushed, check here first for a list of our latest deals and coupons. Our great discounts will help you save money on any maintenance, repair, or accessory installment for your Subaru. Our service staff is knowledgeable and friendly, and are eager to get your Subaru working in prime condition and back on the road as soon as possible. If you're not sure what you need or if you have questions, give us a call at (866) 460-0188 or drop by for a check-up inspection at 11635 SW Canyon Rd, Beaverton, OR 97005. These offers won't last long - take advantage of them today!